TELL THE SCHOOL BOARD : NO SUBSTATIONS UNDER VANCOUVER SCHOOLS OR PARKS! In April 2018, BC Hydro re-announced their plan to install a substation beneath Nelson Park and the Lord Roberts School Annex at 1150 Nelson Street in Vancouver’s West End. The Vancouver Parks Board and Vancouver School Boards are being asked to grant approval. This was proposed last year but dropped after a failed public consultation and push-back from the City of Vancouver. But there are differences between the 2017 proposal and this year’s plan. BC Hydro do not propose to build two schools. There is no guarantee that the cash would be spent in the West End. They seek to lease the space from the School Board, who will decide how to spend the proceeds. The five-year construction period uses jackhammers, excavators and possibly explosives. Noise levels during construction will reach 110dBA, far exceeding the current daytime limit of 55dBA. After construction, noise levels at the exhaust openings will be 78dBA. Noise effects will be noticeable for indoor occupants in the area. The project removes more than 40 trees and other vegetation, destroying habitats for dozens of species. Vibration and noise levels above 70dBA cause birds and animals to avoid the area.The excavation may interfere with the hydrology of the park, adversely affecting vegetation outside the main excavation area. Air contaminants will increase during the five-year construction period. The construction carries risks of electrical hazards, spills, explosions and fires. The completed design restricts fire & rescue crews during emergencies. Property values will likely be impacted by construction noise and health-related concerns associated with electromagnetic fields. Losing large trees and the appearance of ventilations shafts will change the experience of the park and permanently impact the quality of the park. Exposure to electric and magnetic fields is thought to be carcinogenic. BC Hydro reported to the VSB and VPB that there are gaps in knowledge and more studies are needed. Nelson Park, site of future substation? The Vancouver School Board is mandated to provide a safe environment for learning. The Parks Board is committed to preserve and advocate for green space. Nowhere in the world has a substation been installed under a school or public green space. There is no applicable research or health studies for a project like this. No reasonable alternatives have been proposed. The Ministry of Education is pushing hard for the School Board to accept this proposal and on April 9th withdrew funding for a desperately-needed school in Coal Harbour. BC Hydro’s proposal has effectively stalled the construction of a new school for downtown! This is a precedent-setting moment whereby the provincial government favours trading public assets to corporations rather than funding schools themselves. VSB has not commissioned any independent safety studies or scheduled community consultations – only for parents at the school. The VSB answers to ALL taxpayers in Vancouver, not just the parents of one school. If you oppose this project please write to the Vancouver School Board Trustees and tell them to reject the proposal. They are voting in June. The VSB NEEDS TO HEAR YOUR OPINION! If the community’s voice is not heard this project will go ahead. Send emails to tell them to keep our schools safe, our neighbourhoods healthy and our parks green! On June 14th the City Council of Vancouver will consider a motion to designate Mole Hill as a Heritage Conservation Area (HCA). The full motion is available here. Background: In November 2015 Mole Hill Community Housing Society made an application to the city to designate Mole Hill as a Heritage Conservation Area. The proposal generated a tremendous response from tenants, neighbours, members, stakeholders and supporters of Mole Hill who subsequently advocated in favour of the idea. 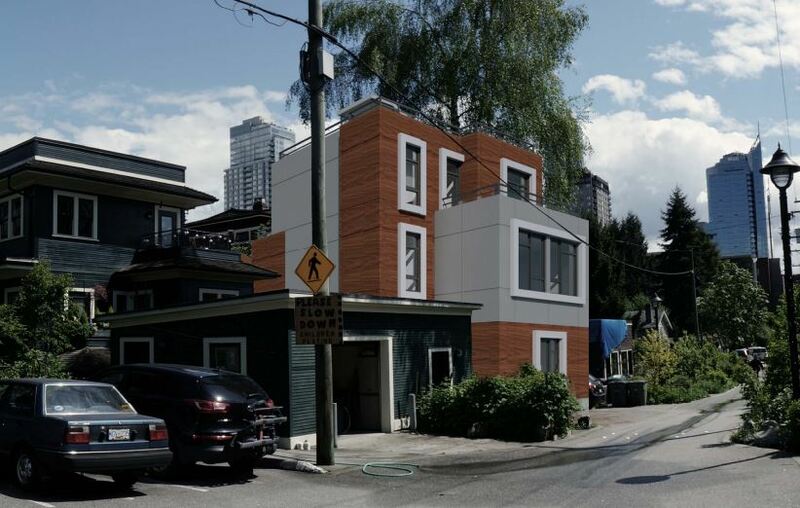 The community was galvanized by development proposals on two privately owned properties on Comox Street which seek to construct dominating modern infill buildings directly adjacent to the award-winning heritage laneway. A third property was recently sold for $3,000,000 and redevelopment is expected. Preserve the existing pedestrian character of the laneway and maintain one story massing for buildings adjacent the lane. In terms of preserving the heritage character of the block for the long term, this is the most significant opportunity since the Mole Hill Community Housing Society was formed fifteen years ago. Mole Hill is a 170 unit social housing development and a model for sustainable community. The internationally renowned heritage landscape contains 30 buildings listed on the City of Vancouver’s Heritage Registry, more than any block in the City of Vancouver. Awards for Mole Hill include the Heritage Canada Award, the City of Vancouver Heritage Award of Honour, the Canadian Construction Association’s Environmental Achievement Award and a CMHC Housing Award for Best Practices in Affordable Housing. Public input will likely be scheduled for the evening of Wednesday 15th June. Cut’n’paste into your address bar to write to mayor & council — encourage them to support the motion! 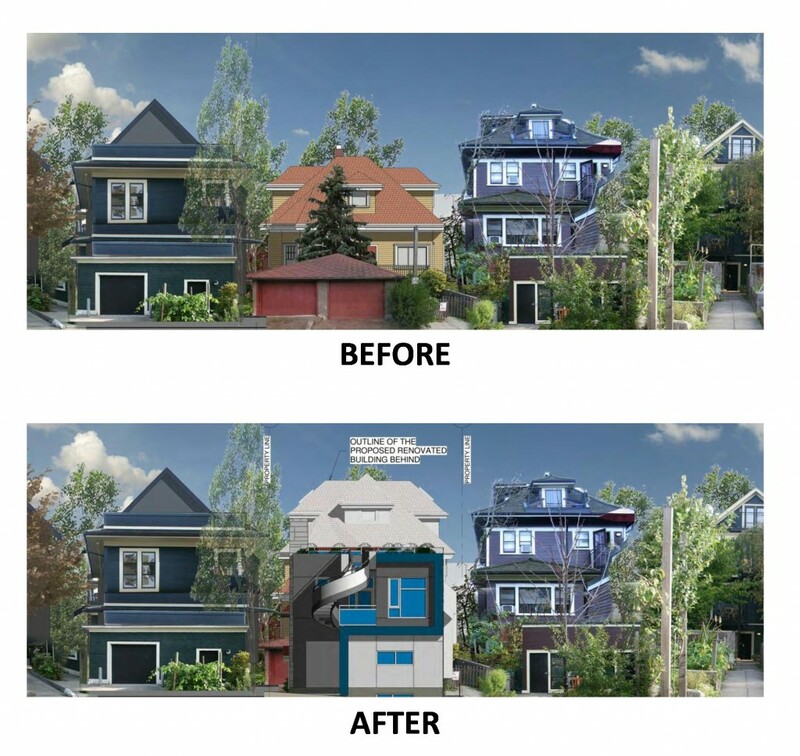 The concept of Mole Hill as an important heritage landscape has been abandoned as the City of Vancouver approves modern redevelopments and the demolition of a house at 1180 Comox Street. Mole Hill is Vancouver’s ONLY intact heritage block. The houses date from 1886, the year the City of Vancouver was first incorporated and includes many of the city’s oldest houses. There are more listed heritage buildings on the Mole Hill block than any other city block. However three privately owned properties on Comox Street now belong to property development companies. City staff and council have repeatedly reassured the community that Mole Hill is not threatened. 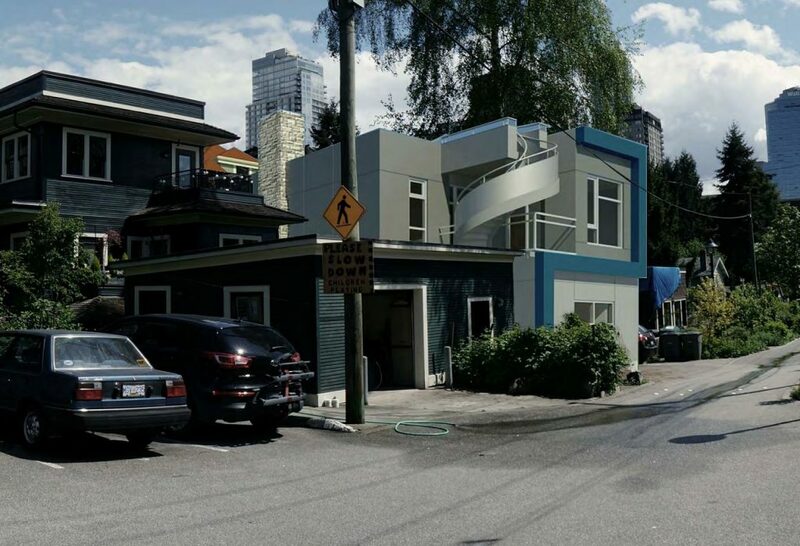 Yet in April 2016 the City of Vancouver took the unprecedented step of approving the demolition of the house at 1180 Comox Street. The property will be redeveloped as a 6 unit apartment building in a modern style. 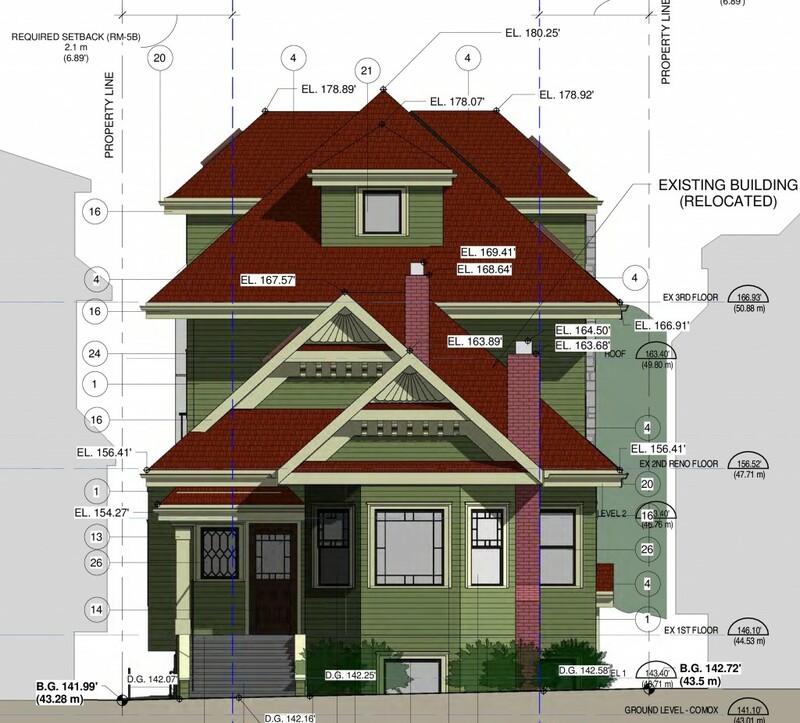 And in February 2016, the Heritage Commission moved to support a development application for 1150 Comox Street for a domineering infill apartment building which is brashly modern in design. The proposal’s imposing modern design is located in the middle of the block, seriously compromising Mole Hill’s innovative and award-winning greenway and ruining the concept of the lane as an expansive heritage landscape. The Heritage Commission approved the plans on February 22nd 2016 but they were not made available to the public until being uploaded to the City of Vancouver website on May 6th 2016. Bylaw exemptions have been requested and granted for building height, site coverage, shadowing etc. The City of Vancouver approved the West End Community Plan in 2013. This plan claims to seek to preserve heritage resources, praises Mole Hill and describes the Mole Hill laneway as “a cherished community space”. However, the Plan’s zoning for Mole Hill is the same as any other block in the West End and permits large-scale infill buildings and no additional protection for the heritage landscape or the traffic-calmed greenway. Mole Hill has received numerous city, provincial and national design awards. The city-owned properties were restored following a decade of community activism that saved it from destruction. It continually receives accolades from the public for its forward-thinking embodiments of heritage preservation, green building design and sustainable community development. Dozens of community members, including Spencer Chandra Herbert MLA, and architect Sean McEwan (who oversaw the restorations at Mole Hill) have written to the city in recent months requesting stronger measures to preserve the heritage character of this block. Development of these properties seems inevitable, but community advocates strongly feel that the city should approve designs that do not conflict with the heritage landscape and respect the one-storey massing adjacent to the greenway. A public meeting to discuss the future of Mole Hill is scheduled. Mole Hill Common Room, 1157 Pendrell Street, Vancouver. 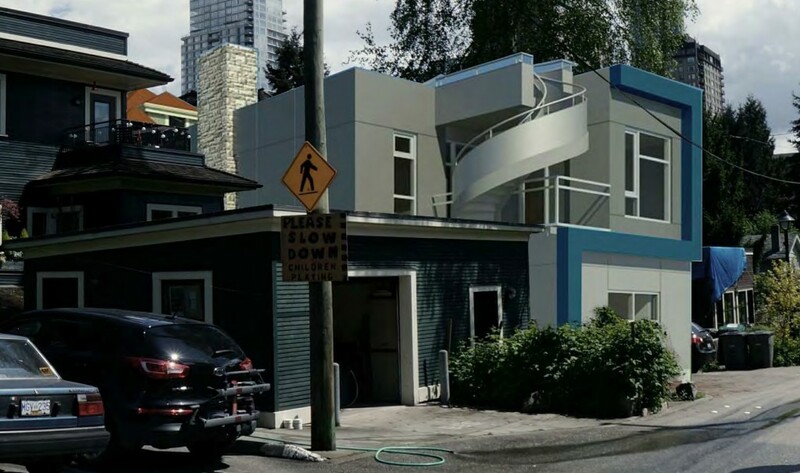 In April, many West End residents attended an Open House hosted by Ankenman Marchand Architects, who presented a proposal to develop 1150 (now referred to as 1158) Comox Street on behalf of the property owners, Vandwell Homes. This is one of the eight privately owned properties on the Mole Hill block not belonging to the Mole Hill Community Housing Society, who operate twenty-eight of the properties. They proposed moving the house to the front of the property and constructing an apartment building at the back. However, the development application was rejected by the City. This was encouraging news as there were numerous problems with the proposal – parking, heritage preservation, and density & siting concerns (the physically dominating aspect of the proposed infill building). However, a new development proposal has been submitted, with a similar design. Once again the proposal is to move the existing house to the front of the property. 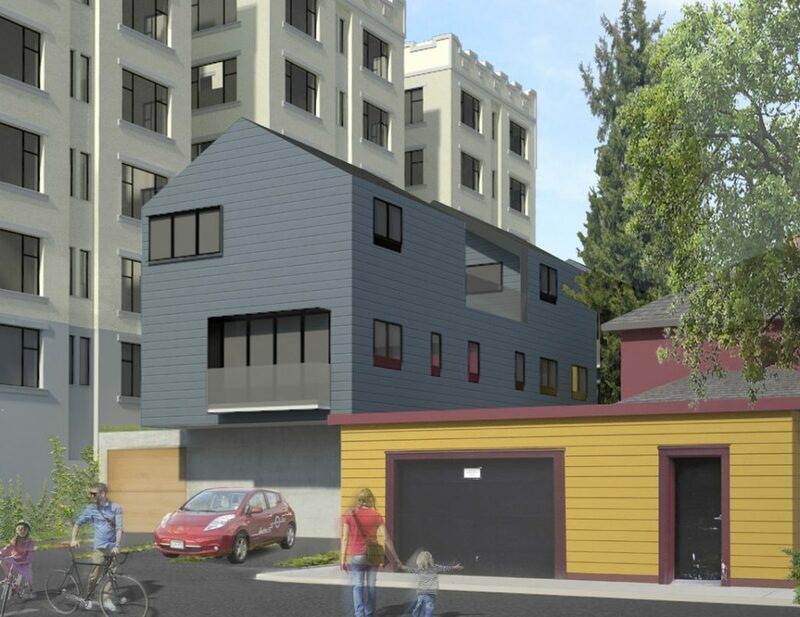 A large infill construction is to be added to the house and a modern apartment building backs onto the Mole Hill Laneway. Under the site’s RM-5B zoning, the application is “conditional” so it may be permitted; however, it requires the decision of the Director of Planning. 1150 Comox Street is not designated a heritage building yet the architects are apparently seeking a “Heritage Revitalization Agreement” with the City. Such an agreement offers compensations to the developer in exchange for protecting the heritage asset. Normally the compensations takes the form of variances in the use, density and siting regulations. Like the previous proposal, and another application this year for 1180 Comox Street, the scale and design of the infill building seriously compromises the integrity of the Mole Hill block from a heritage perspective while the proposed relocation of the original house negatively alters the famous Mole Hill streetscape on Comox Street. Among the other concerns: the building will dominate the Mole Hill laneway, wrecking it’s expansive interior and imposing upon the neighbouring historical properties; the construction period will disrupt the community and threaten the adjacent community gardens; contrary to the established nature of the Mole Hill Community the completed units will be 100% privately owned with no affordable housing component or rental options. There are numerous questionable items in the plans that were posted online. Most obvious is that the owners of the property incorporate part of the property belonging to Mole Hill Community Housing Society into their design – notably encroaching upon 1154 Comox. This would of course not be possible. There are other such items regarding the placement of trees, fences, neighbouring structures etc. that take a creative approach to the actual layout of the properties. There is further concern regarding the manner in which this application has been made and the absence of public consultation. There are over 200 adult tenants who rent from Mole Hill Community Housing Society. Additionally there are over 100 adult tenants in the Strathmore Lodge or who occupy rental suites in the four or five other privately owned properties on the block. Several hundred more reside in rental apartments on Pendrell Street. However, of the several hundred residents of this block, less than 10 will have received the postcard that notified of this application because they are not property tax payers. There is no reason why the developer should not be required to alert all tenants in the neighbourhood, as is easily done by other organisations such as film companies or even the City of Vancouver (recent notices re. parking consultation were ubiquitous). The City of Vancouver website states that “comments should be received on, or before November 27, 2015, to be considered in the staff review.” Yet a public notice was not posted at the property until December 1st 2015. A city staff member informed us that the comment period had been extended to December 16th but at the time of writing that is not reflected in any public notices or the City’s website. The City of Vancouver website lists this as 1158 Comox, which would mean the house addresses on Comox Street will go 1146>1158>1154>1160. Any person visiting Comox Street to view the property during the advertised staff review period would be unable to identify it. This bizarre non-consecutive re-numbering of the address, together with the absence of notice and the confusion surrounding deadlines for comments seemed designed to obfuscate information about the development. It is a very discouraging approach to development planning, particularly in such a sensitive heritage area as Mole Hill. The city is accepting written comments (letter or e-mail) on this development application. Comments should be received on, or before Wednesday December 16, 2015, to be considered in the staff review of the project. The contact to submit your views is John Freeman, Project Facilitator, john.freeman@vancouver.ca , 604-871-6076. If you wish to view the printed plans, or to discuss this further, please contact Quentin Wright, Executive Director of Mole Hill Community Housing Society at: 604-681-2096, qwright@molehillhousing.ca. We will keep the community informed on any further developments.